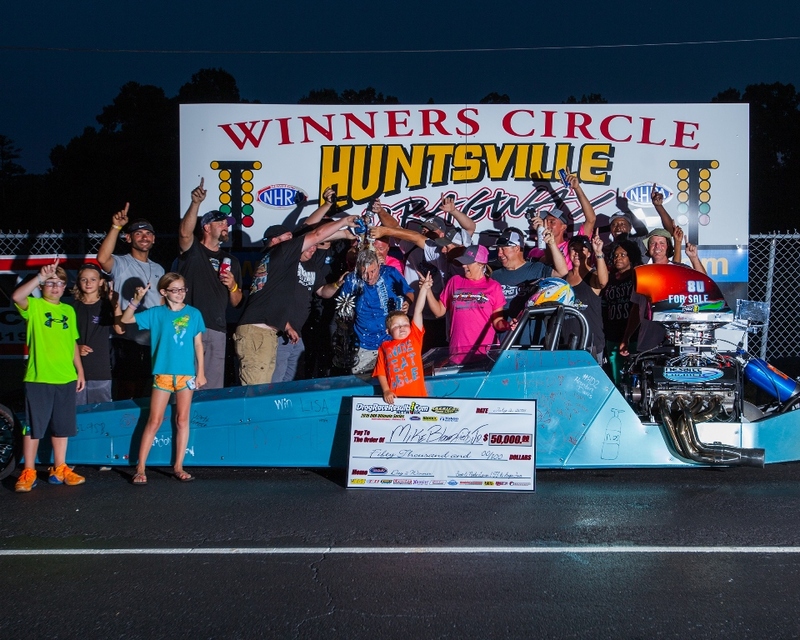 Event #2 of the 2016 DRR Ultimate Series in Huntsville, Alabama this past weekend saw clear blue skies, great racing action, and a phenomenal field of over 160 Big Bucks Bracket Racers from across the country competing for over $150,000 just in Big Checks for the 4 day race. Wednesday kicked off the 5 day long event with the Champ's Performance FTI Warm-Up Test-N-Tune where the evening was completed with a "FREE" Run for the FTI Converter to all Test-N-Tune participants. 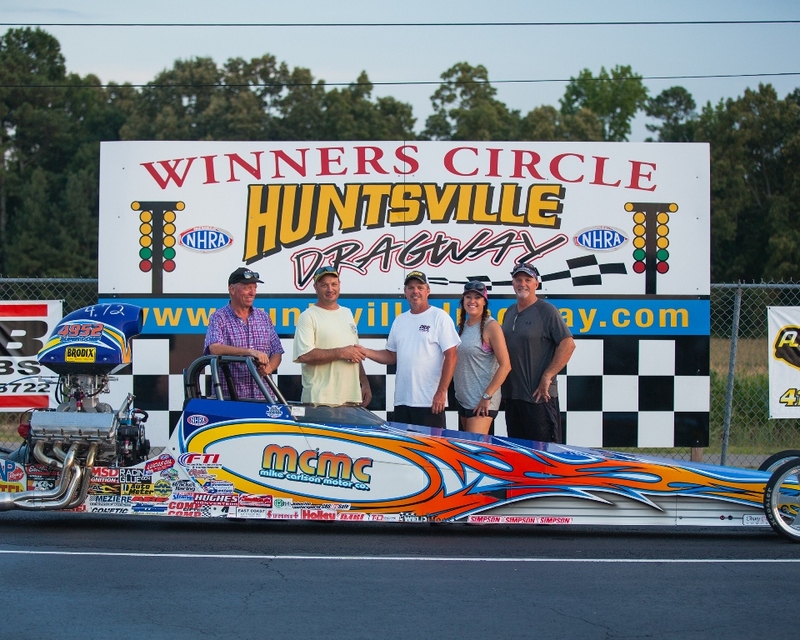 Tracy Guffey sat on the pole with a dead on .0003 up until the final pair down the track. 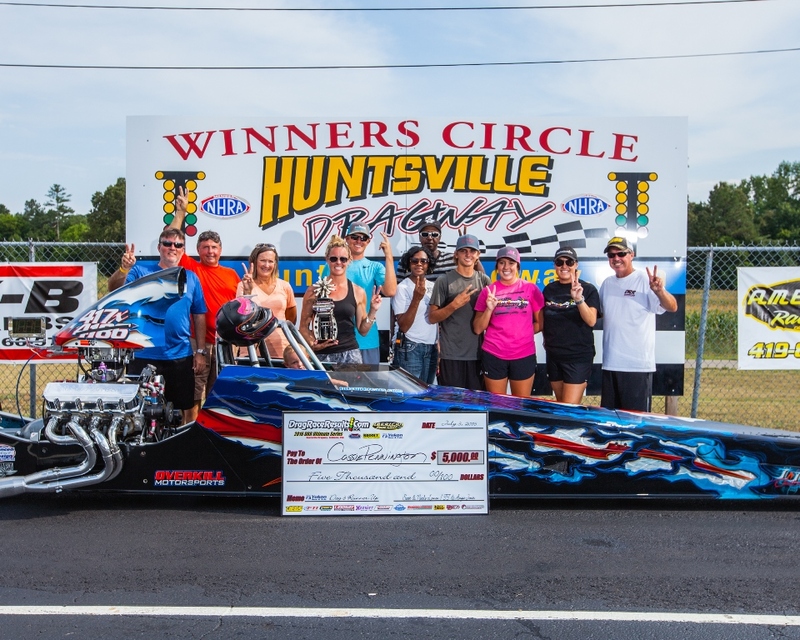 Ron Lane then brought up his 4.5x dragster as one of the last 2 cars down the track and laid down a .0001 run to steal the run from Guffey and take home the FTI Converter from Champs. 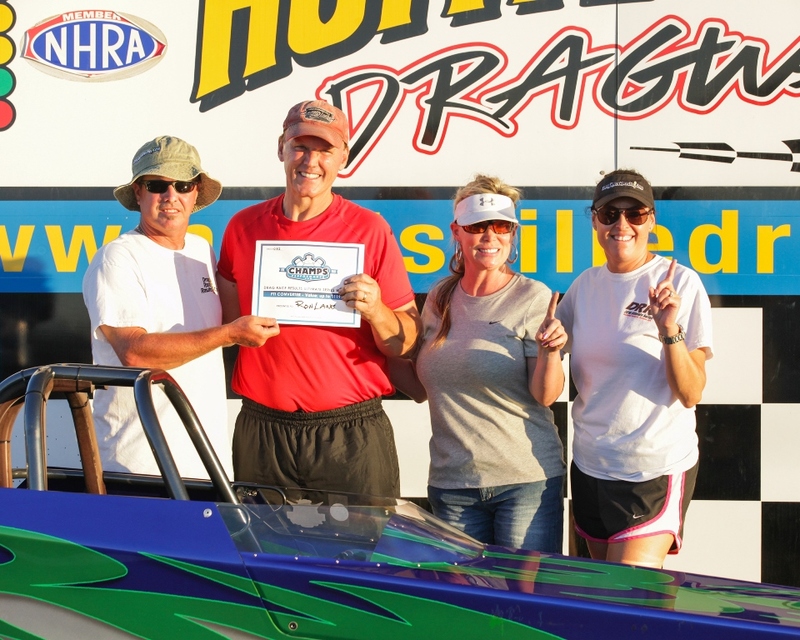 Ron Lane out of Chattanooga, Tennessee used his momentum from Wednesday's Run for the Converter and defeated Louisiana's Johnny Ezell for the first "Big Check" of the weekend. 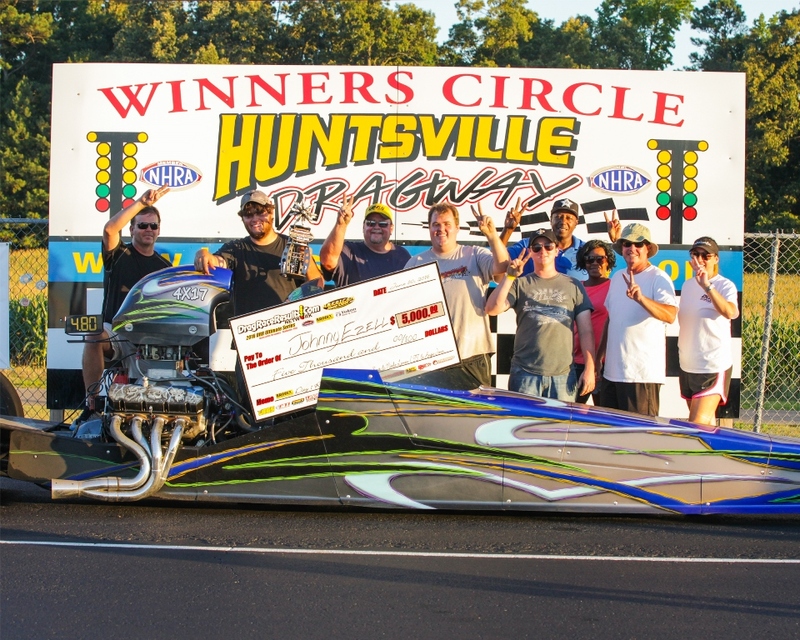 Ezell no stranger to the Big Bucks Winner Circle lately, used a .003 take .003 lap to only come up short for the win as Lane had plans of his own and trumped Ezell with a perfect .000 light and 4.564 on his 4.56 dial "4 pack" . Lane used a .001 / 4.564 on the 4.56 dial to defeat Alabama's Danny Weaver in the Semi Finals. Ezell, equally as tough used a .003 / 4.779 on the 4.77 to defeat Ken Gentry in his bright red Camaro on the other side of the ladder. 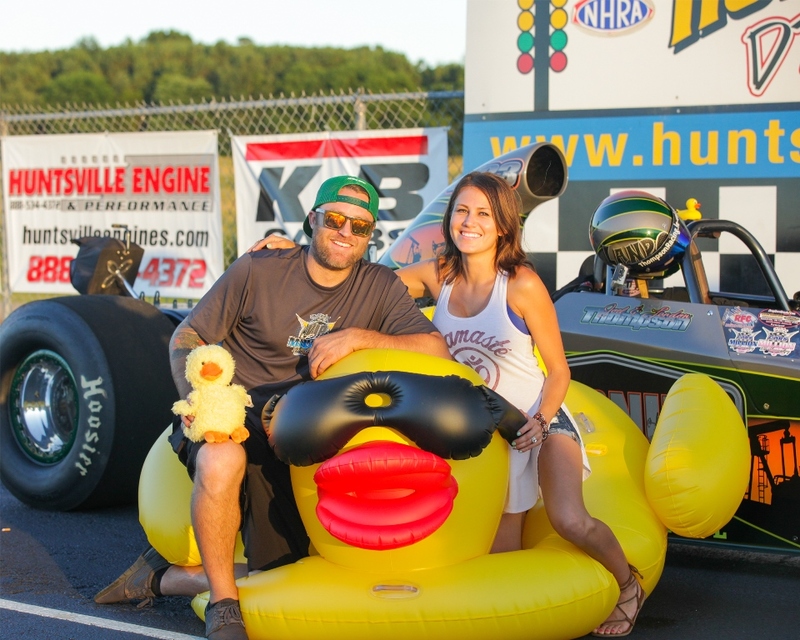 Landon Thompson won the Quick Fuel Technology Duck Race Thursday night when he defeated Jarod Wilson in the "FREE" 16 Car Shootout for the QFX Carburetor. Wilson received $250 and the Semi Finalists each received $150 thanks to Quick Fuel. Million Dollar Bracket Race Winner - Nathan Martin made the trip from Texas and started the weekend off with a new Complete Aluminum Center Section in the "FREE" Yukon Gear and Axle Run for the Center Section with his dead on .0001 lap. 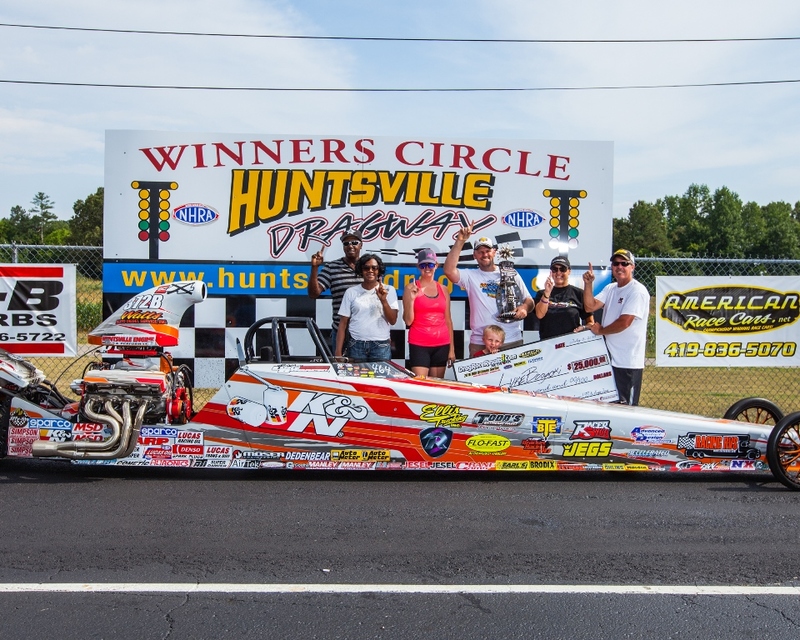 Jeff Strickland used the Re-Entry Round to his advantage and averaged .007 on the tree after losing in the first round to bring home $25,000 and the "Big Check" to Red Bay, Alabama. 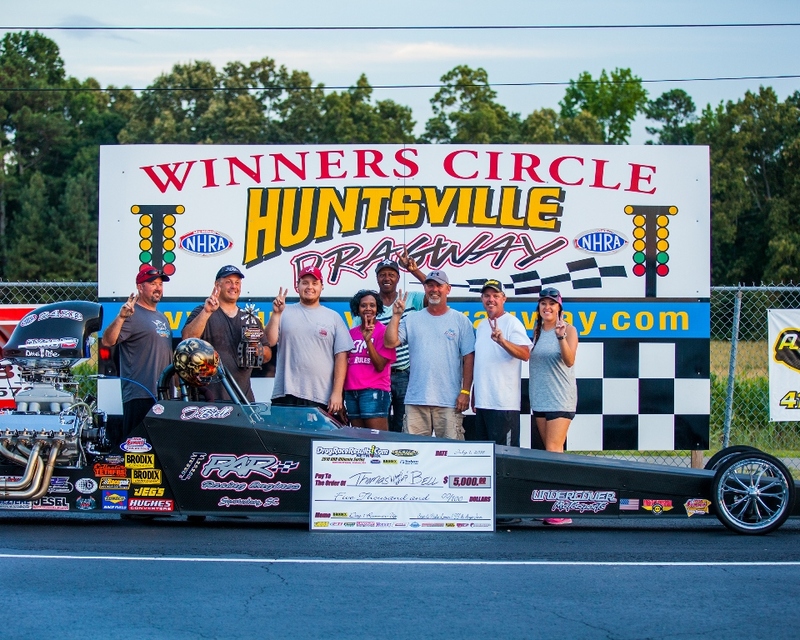 Strickland defeated a red lighting Thomas Bell from North Carolina in the final of Friday's Brodix $25k. 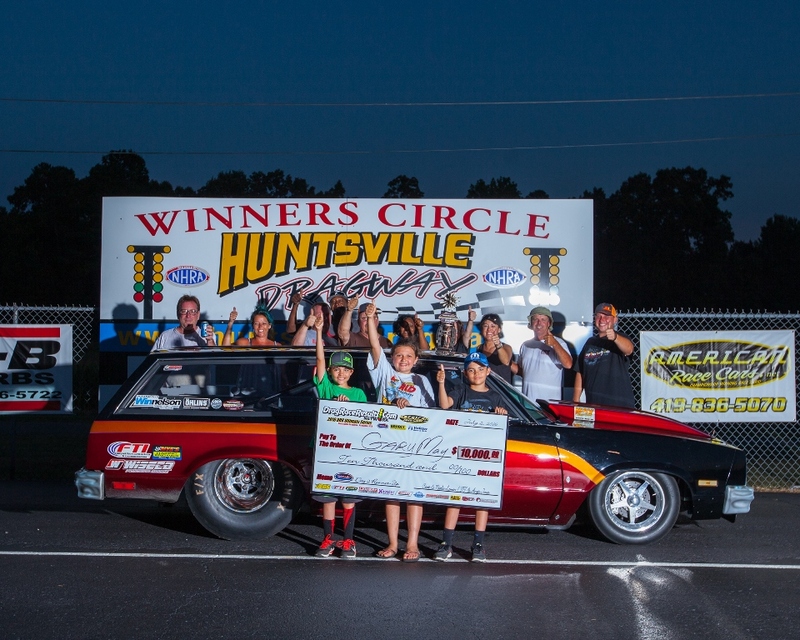 Strickland, calm and quiet by nature is always quick to think and it showed with his racing skills on Friday along with the "Shute Drop" 4.94 on the 4.58 dial at the finish line after Bell's red light and sent the crowd of a hundred or so at the starting line into cheers! 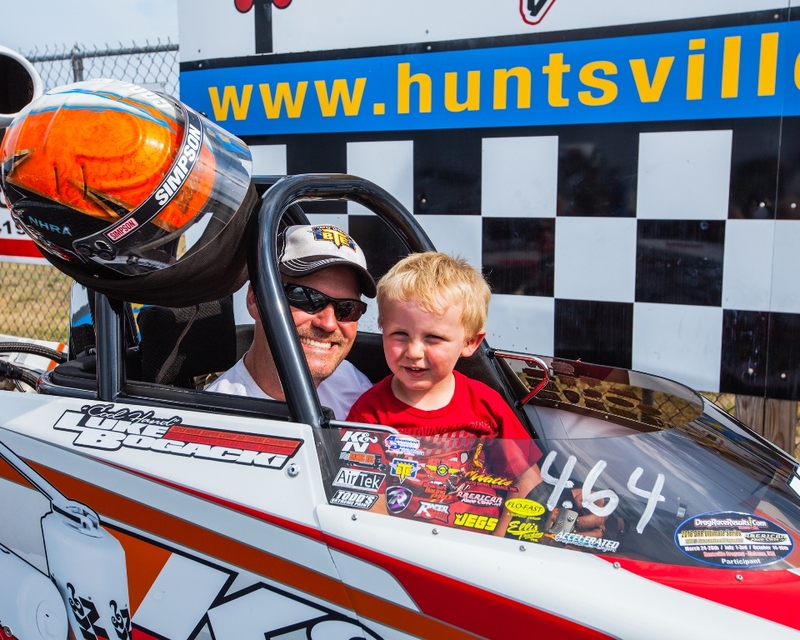 Bell who had to replace a rear end center section made his way through the field in his 4.4x dialed dragster and defeated Luke Bogacki from Carterville, Illinois when Luke turned it red by -.002 in the semi finals. Strickland on the other side of the ladder was reeling off .00x lights of his own and matched up with Canada's Russ Adams. Adam's turned it red by the slimmest of margins with a -.000 and sent Strick and his .007 early shut off run to evening's final round. 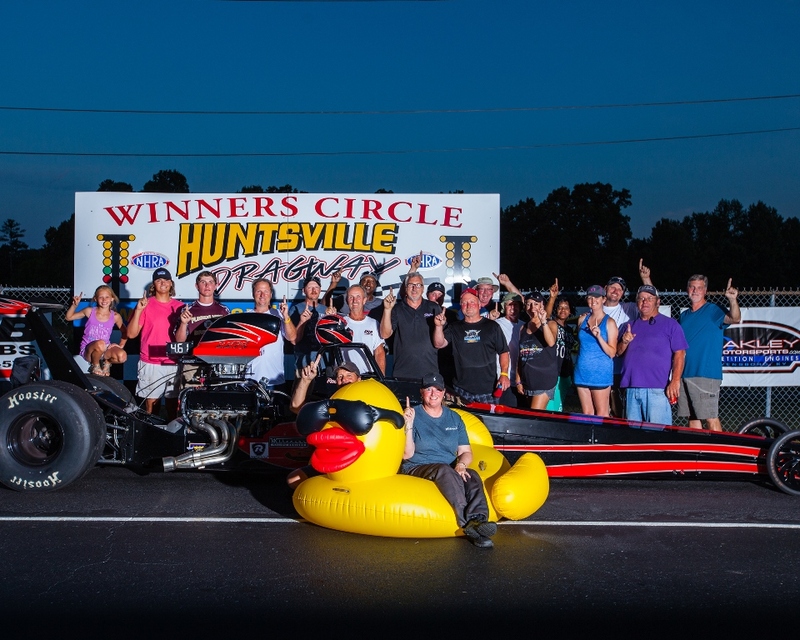 Jarod Wilson won the Quick Fuel Technology Duck Race Friday night when he defeated Stephen Hughes in the "FREE" 16 Car Shootout for the QFX Carburetor. 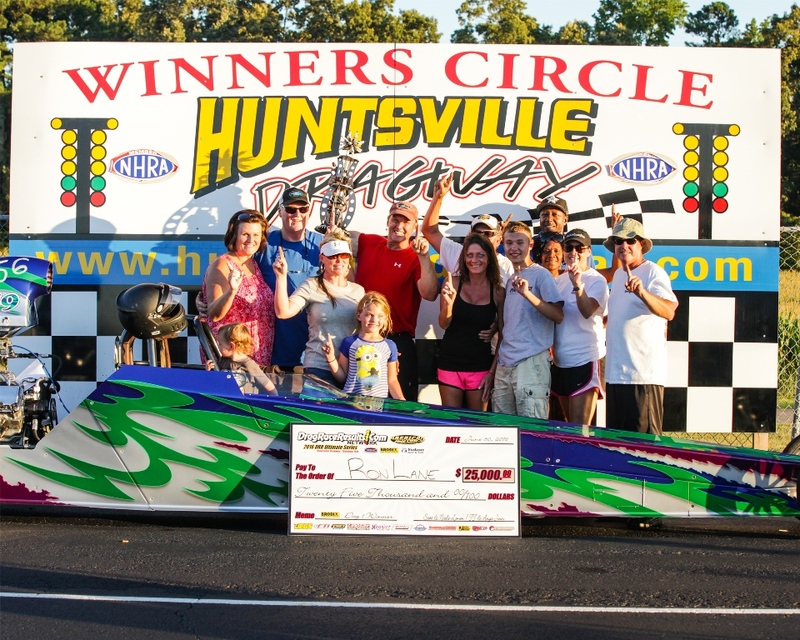 Hughes received $250 and the Semi Finalists each received $150 thanks to Quick Fuel. 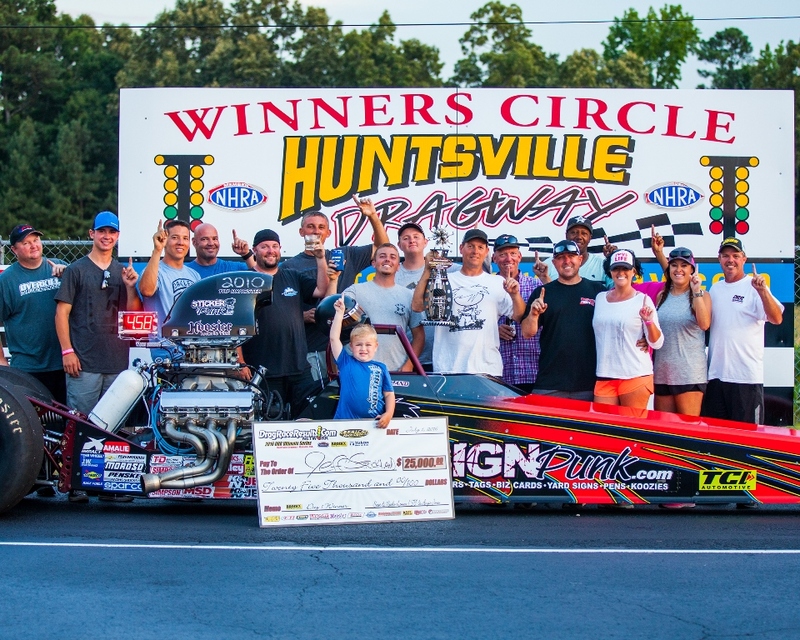 Mike Bloomfield Jr. has been raised in Big Bucks Bracket Racing per say. His father, Mike Sr. is well known for fielding a multi car operation with some of the best Big Money Bracket Racers ever to drive for him. But Saturday was "Little Mike's" day. He showed the talent that he has been taught his whole life, winning rounds he should and winning those he must in order to make it to the biggest final of his young racing career. Averaging .011 on the tree through the 8 rounds Bloomfield stayed solid while he made his way to the Semi Finals where one of the Nation's hottest drivers and KB Kevin Brannon awaited. They left the line nearly identical with Bloomfield having the slight advantage .011 / .013, but at the finish line it transpired into and additional .004 of margin and a dead on 4.776 on the 4.77 and the trip to the final round. On the other side of the ladder it was multi time $50,000 Winner Gary May. May in his deadly wagon had made his way through the Door Car Side and had paired up in the semi finals with Alabama's Brandon Taylor. May used his .008 tree and starting line advantage to advance to the final round and the matchup with Bloomfield. In the Oakley Motorsports $50,000 Final Round it was over before it started when May turned it red -.007 to hand the win to Bloomfield. 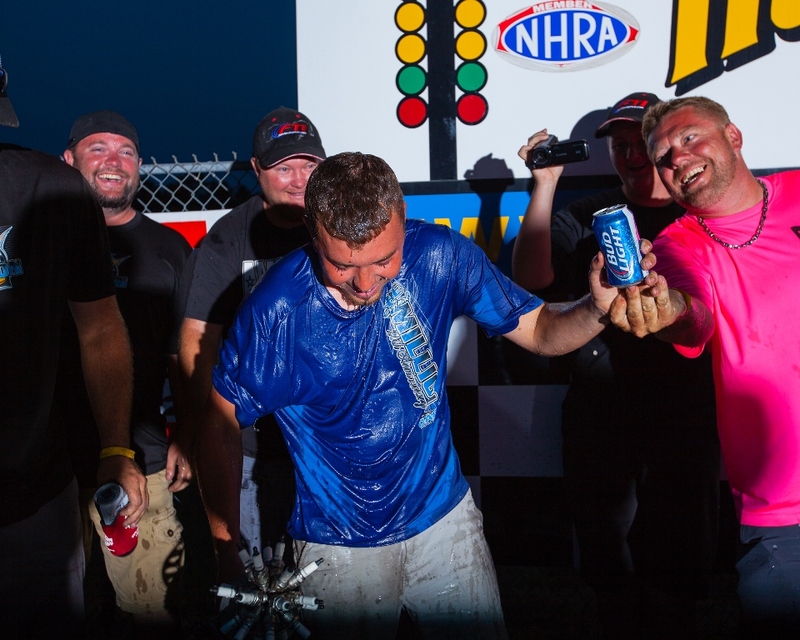 Mike Bloomfield Jr after being drenched in "Cold Beers" by his buddies after the big victory. Gary May along with friends and family celebrated a great Saturday Night Final Round. 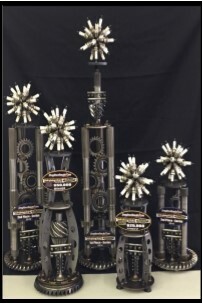 Rachael Henderson won the Hoosier Racing Tires Duck Race Saturday night when she defeated Danny Weaver in the "FREE" 16 Car Shootout for the Hoosier Tires. Weaver received $250 and the Semi Finalists each received $150 thanks to Hoosier. 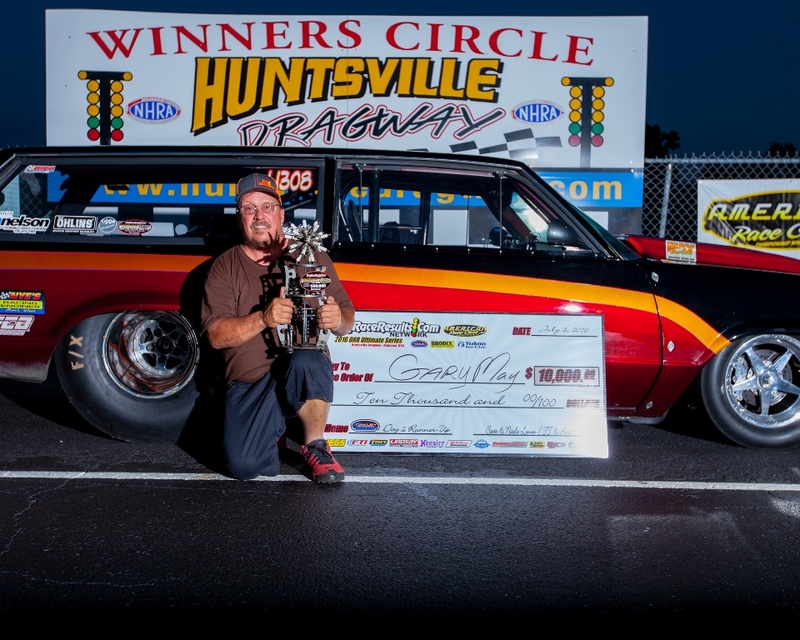 Tracy Guffey and his gorgeous Candy Brand Wine 67' Camaro capped the weekend off with a new Complete Aluminum Center Section in the "FREE" Yukon Gear and Axle Run for the Center Section with his dead on .0001 lap. Going into the weekend, current points leader Luke Bogacki made a move with his points numbers and switched the numbers on his two cars, feeling he may have an advantage with his own car instead of his wife's American which he had won with earlier in March. We spoke prior to the event and Luke mentioned that probably whatever he would do would probably be wrong and up until Sunday was proving so as he took the #4 car of Jessica's to the Semi's on Friday and seemed to be going more rounds with it. Fast forward to Sunday... And the Man was on a mission! Skipping the Re-Entry Round in both cars and 13 laps later Bogacki was averaging .007 on the tree and no worse than .014 and fell only to himself when the ladder round paired him with himself. Abandoning the known lower car in the points, Luke chose his 2016 American for the final round duty. On the other side of the ladder it was Cassie Pennington from La Vernia, Texas who had been wading through the stellar field of Big Money sharks. She defeated "Neon" Leon Robertson in his AK47 Monza to face Bogacki in the finals. Pennington oh so slightly missed Luke with a piercing bullet of a light by a few ten thousandths when the -.000 red came up. Luke on the other side was vulnerable with a .017 tree and both ran it out to show their hands. Pennington 4.725 on the 4.72 and Bogacki 4.634 on the 4.64. Would of could of should of as many know, this race will be decided another day. Luke and Gary Bogacki - Good Times! The Pennington Family made the trip over from Texas, with Cassie holding bragging rights for the trip home.